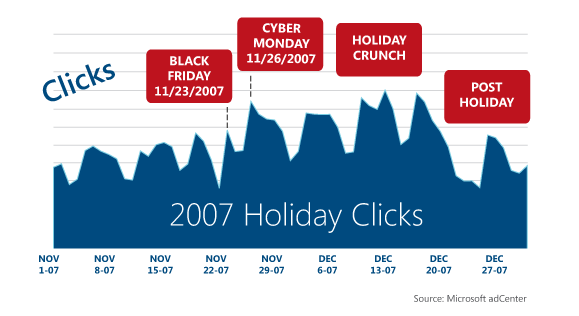 Microsoft’s adCenter blog has posted their 2008 Holiday Advertising Guide for search advertisers. 1. Hitwise Market Share in all Categories, 2008. 2. iCongo/Harris Interactive, April 22, 2008. Based on the percentage of consumer interest and barring any data suggesting otherwise, shipping costs appear to have become the largest remaining barrier to consumers shopping and buying online. Can elimination of shipping costs insure and increase internet retailers sales prospects this 2008 holiday season? As the largest online retailer, Amazon.com demonstrated their understanding of the power of free shipping by offering it during the 2007 holiday season. Amazon is again offering free shipping this holiday shopping season with some conditions through their Amazon Prime Member program. In this current economic climate, aren’t internet retailers who don’t follow Amazon’s lead by offering some type of free shipping risking transaction losses to internet retailers – like Amazon – who do? Internet retailers who advertise free shipping this holiday season can forecast a larger percentage of transactions generated via search from within their market than internet retailers who don’t.